Two Glenpark ladies recently traveled to Brighton to run 26.2 miles. The race started on a downhill from Preston Park in the middle of town, it was an undulating route which included many twists and turns and and out and back to the furthest points at the opposite ends of Brighton. The supporters were fantastic and kept the 19,500 runners well fed with jelly babies, jelly beans and oranges along the route. The weather started off hazy, then the sun came out and both runners finished in the rain! Cheryl Thomas, was running her 1st road marathon, having previously done Fort William trail marathon in 2016. The Jog Scotland leader and regular parkrunner smashed 55 minutes off of her previous best, finishing in 4hrs 15mins seeing her hard work and training pay off. Fiona Cushnaghan is a veteran marathon and ultra runner and was completing her 20th marathon since 2006. Having picked up a recent injury, she was happy to finish the race in 4hrs 35mins. Both ladies said never again, but watch this space!! Both ladies had a great support team down in Brighton with them and wanted to thank them all for their help and support. 4 Glenparkers made the short trip to Fairlie for this years running of the Kaim Hill Race. The 1100 feet ascent to the top of Kaim Hill is made over tough terrain, and runners were generally slower this year than last due to the marshy underfoot conditions. Marianne McKay and Mick Dunn made the return trip to North Ayrshire but neither were able to beat their times from last year. Although Mick will be happy to come home with one less broken finger this year! Juniors Harry McGill and Ryan Brown made the return trip and ran together the whole way and showing good form over the tough course. Stephen Trainer and Chris Mooney ran at the 10k track event at Glasgow’s Crownpoint track on Friday 20th April. Stephen, running in the A heat, finished in 9th overall in 32.08, just 30 seconds behind his pb. Chris ran in the B heat and finished in 33.27 to take over a minute off of his 10k pb set on the road 2 years ago. Claire Melville made it back to back to back pbs at Greenock parkrun on 7th, 14th and 21st April. Claire has taken almost 2 minutes off of her time in that period, and dipped under the 30 minute mark for the first time. Hopefully this is a sign of things to come over the summer with the return of the popular Wednesday night sessions in the Battery Park. 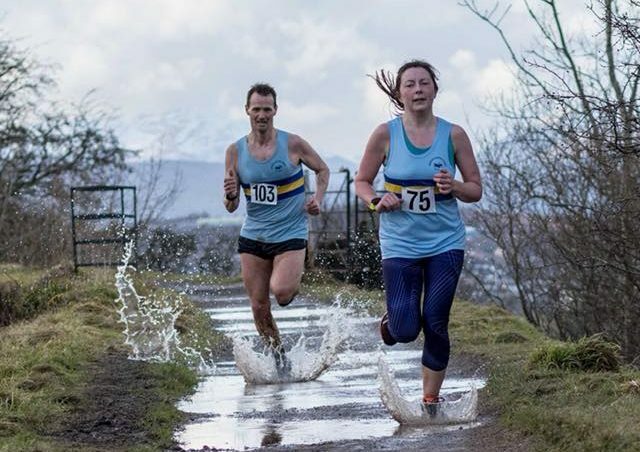 Charlotte McKay and Derrick MacNish added to the Harriers PBs on 21st April on a morning where Chris Mooney took another first place finish, showing no ill effects of his 10k efforts on the track the previous night. This entry was posted in Uncategorized on April 22, 2018 by greenockglenparkharriers.